Did you know our eyes actually see everything upside down and backwards? Learn about light properties, how our eyes see, and how early telescopes and early cameras work by making your own camera obscura. Describe how light can be produced, reflected, refracted, and separated into visible light of various colors. GBO Suggestion: You may want to do the How does light work? Angles of Reflection activity before this one. Before doing the activity teach your students how human eyes work. You can use the videos on the video tab, slideshow on the PowerPoint tab, or interactive on the interactive tab to teach your class these concepts. You may also want to review the properties of light with your students, particularly that light is made of waves that are reflected and refracted all around us before entering our eyes. Depending on how many cardboard boxes you have available, you can choose to do this activity in groups or individually. All sizes of boxes will work and recycled boxes work perfect! You can also choose to give your students more or less instruction with this activity. With less instruction you make the activity more of an engineering challenge. The human eye (as well as those of other animals including birds, fish reptiles etc.) belongs to a general group of eyes found in nature called "camera-type eyes." 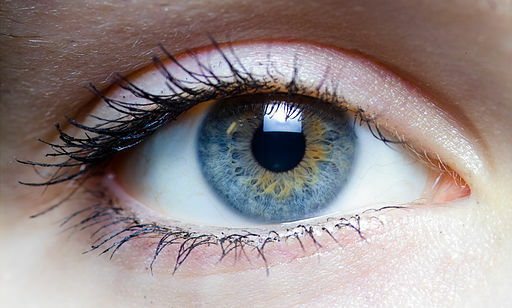 Light-waves from the sun, or artificial light, travel and bounces off objects, entering our eyes through the pupil. Depending on the amount of light, the iris changes the size of the pupil to let more or less light in. Then the light passes though the lens (just like a camera lens) focusing light onto the back surface of the eye's light-sensitive membrane called the retina. The image formed on the back surface of the eye (and camera obscura) is upside down and backwards. It is our brain that changes the image to upright and corrects the image from right to left. All eyes of all animals work this way. All early telescopes and early cameras worked this way as well. A camera obscura is a perfect way to demonstrate this phenomena. By blocking out almost all of the light except for a pinhole, we can view the mirror and upside down image our eye encounters before our brain adjusts it. You may choose to discuss aperture and clarity as well. With a small pinhole, we can view a more clear image in the camera obscura because we have less noise in our image. With a larger hole (greater aperture) we get more information (better color) but our image quality decreases. This is why a telescope needs a lens, to focus all of the light entering to a single point and a clear image. Have each student or student group decide how to orient their camera obscura on their cardboard box, select the front and back, top and bottom. Open your box and cut a white piece of paper to fit the back of your camera. Securely attach your paper to the box, this allows for a clearer image than using the cardboard box alone. Make sure the inside of the box is free of extra cardboard that may block light or viewing. Close the box and select a place to cut a hole approximately 1 inch by 1 inch in the front center of the box. This will be the place you will be placing your pinhole. After cutting the hole, secure aluminum foil over the top with tape, you will be making your pinhole in a future step. 1. You may put it in the bottom corner of the box on the same side as the lens, but where when held up to view, a person’s head will not interfere with the light entering the pinhole lens. 2. You can put it directly under the pinhole lens near the bottom of the box to use with a cell phone. You can not use this location to view with your eye, because your head would block the incoming light. 3. Either way, cut just enough area for viewing. You do not want to allow extra light to enter the box through this hole when in use. Once again, make sure the inside of the box is free of extra cardboard that may block light or viewing. Tape the box shut and block out all light from the camera except for the viewer hole. Now make a small hole in the aluminum foil with your pushpin. Test your camera where there is strong light, near a bright window or outside (works best). For a cell phone camera, you will want to attach your phone’s camera to the viewer, you can use heavy rubber bands, or tape to aid you. It takes a little adjusting to get the camera lens in the right place. You may need to adjust your hole a little bigger with the pushpin to see the image. Look for objects that move in your camera. Take pictures or videos. Have a friend go in your field of view and jump up and down or watch cars passing by. Take turns with others to see how each camera obscura works a little differently. Experiment with making your hole a little bigger, does the quality of the picture decrease? Can you see better color? Using a cell phone? Take some pictures or videos with your camera. Please download the printable version for the lesson plan with pictures and extensions. Slide 1: The images we see are made up of light reflected from the objects we look at. Slide 2: Whether direct or indirect, natural or artificial, it is the scattering of visible light that enters our eyes so that we can see. Slide 3: We only see the visible light that enters our eyes. Other animals see a wider or different light spectrum. Bees can see ultraviolet light, snakes can see infrared light. Slide 4: We also see colors differently than other animals. Lets look more closely at the human eye. Slide 5: The iris is like a shutter of a camera, determining how much light to let in. The iris contracts to let more light through the pupil when conditions are darker. The lens in a human eye and a camera do the same thing! Focus light to create an image in the back of the eye on the retina. The cornea is like your camera’s cap, it protects the eye. The optic nerve sends the optic message back to the brain, but check out the image as it would look on the retina in the next slide. Slide 6: The image in the back of the eye is upside down! This happens in both our eyes and in cameras! It is due to the way light reflects off objects. Slide 7: This slide sums it all up. Pretty cool! Slide 8: By making a camera obscura we get a pretty good idea of how the eye and light waves entering the eye work. Slide 9: If you get a chance to experiment with the size of your pinhole, look for image quality versus color. A smaller hole allows only a small amount of reflected light into the box, so the image is clear. When you enlarge the hole it allows more light in, giving your picture better color, but a blurry image. Why is this? Great fun and very short introductory video. This video has more in depth information on how the eye works. This video has a lot of information packed in! You may want to pause it multiple times to check for student understanding. You could also have students fill out a worksheet on the eye when you pause. Sometimes a demonstration is the best way to get kids thinking and understanding. You can show this video of a demonstration of how an eye works as an introduction. This could be a great video to show to younger students after showing and discussing the Bill Nye video above. This can serve as a thought provoking conclusion video. After doing the activity remind students how the brain must "interpret" what the eye sees and ask students how they think animals other than humans see. Then show this video. This video explains how a camera obscura works and explains how and why the picture will be different depending on how big your pinhole is. This video is a fun way to introduce the camera obscura or the extension activity if you are attempting to make your classroom into a camera. Ready to circle back to astronomy now? Use this great video to relate the camera obscura to telescopes. This is a fabulous interactive computer simulation. Your students can learn eye terminology on the first page, and discover how the eyes sees and focuses on the second page.